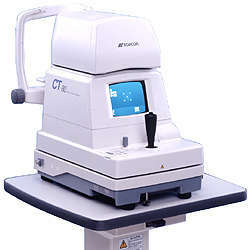 NCT Topcon - Ophthalmic Equipment and instruments for the professional of today. The NCT Topcon CT-80 takes its original measurement method using two sensors; one for light and one for pressure.When the air puff applanates the cornea a light sensor detects the applanation moment, while at the same time another sensor monitors the internal chamber to obtain the intraocular pressure. The NCT Topcon CT-80 features an innovative triple safety function. First, an adjustable safety stopper may be set by the operator.Second, a "too close" display on the monitor guides the user in alignment. Third, an audible warning buzzer informs the operator if the cornea and the instrument are too close. The NCT Topcon CT-80 provides easier and faster operation with the aid of a new alignment bar and an improved air cylinder. The interval between measurements has been reduced by over 30%, so that patients may be examined more comfortably in a shorter period of time. Once the alignment has been completed, the resulting data are automatically measured and displayed. The NCT Topcon CT-80 lets the operator know in advance when maintenance is needed. It displays a warning message on the monitor when a lens is dirty, and also which lens it is (the measurement glass or the chamber glass).